Other than QB Johnny Manziel otherwise known as “Johnny Football” Texas a&M’s offense last season was all through WR Ryan Swope. At 6’1” 206lbs he has a bigger build than other slot receivers like Wes Welker, Brandon Stokley, and other guys in the NFL Draft like Tavon Austin and DeAndre Hopkins. Swope is also a finalist to become the cover boy of the new and upcoming NCAA Football 14 quite an achievement for Manziel and Tannehill’s sidekick. He made a name for himself in 2010 as a sophomore playing with QB Jerrod Johnson who was a senior captain that year; they also entered the season with high expectations with players like WR Jeff Fuller and LB Von Miller. Swope caught 72 passes for 825 yards and 4TD, not too significant in terms of touchdowns but very reliable in terms of his hands and routes. He caught 55 of those 72 passes in the games they won. Not bad for a guy who as a freshman he was playing DB. You can say that the move to WR was a great career move. As a junior with a new QB, in fact you may have heard of him, Ryan Tannehill who became the 8th overall pick of the Miami Dolphins. Swope quickly became the favorite wide receiver like how Andre Reed was for Jim Kelly. He finished the season with 89 catches for 1207 yards receiving and had 11TD. The improvement in his game showed on film/highlights and on the stat sheet. Another year, another QB, this past season he had little know Freshman (RS) QB Johnny Manziel. I saw the game vs. Florida and I noticed the double fake play action where they brought in the backfield. That’s similar to how Percy Harvin was used at Florida. Swope showed over the course of the season he could run block and very well. Overall he still had 72 catches 913 yards and 8TDs as a senior, not bad for a team that became a zone-read team. His best games were against the Alabama teams (Alabama, Auburn). In A&M’s upset over the Crimson Tide he had a season high 11 catches 111 yards receiving and a TD. He was a matchup nightmare. After the upset there was a standing ovation for A&M by some Tide fans. That’s respect. As for Swope he was heavily targeted throughout. Against Auburn He scored 2TDs in 6 catches along with 140 yards. He showed in this game that he could be a threat all over the field not just in the slot. Granted Auburn struggled, 63 points for an offense in the SEC is quite impressive. How do I characterize Ryan Swope? He is grit and balls and we all know what that can do, and in a league full of pre-Madonna guys like Randy Moss over the years, Swope could be a great contradiction of that. After all he runs a 4.34 40 yard dash, much better than anyone would’ve ever thought (all stereotypes aside). Before the combine many would say 4th round pick AT BEST, but one of the few that think this guy is legit and the real deal. According to CBS Sports he’s at the 83rd pick of the Draft (mid 3rd round), to me he’s top 40 value. Swope has speed, acceleration, great hands, good routes, and most of all he can play on the outside as a z receiver, or as a slot. Some comparisons include Jordan Shipley, Brandon Stokley and maybe Wes Welker not for me though. I see him as more of an Andre Reed type, where he’s not a big play guy but to compare him a HOF’er is a stretch but I will stand by that statement. The best fits for him would be the Minnesota Vikings, Kansas City Chiefs, and Carolina Panthers. Minnesota made the playoffs last season thanks to Adrian Peterson and that defensive line. But they need to have a playmaker to compliment Harvin and Rudolph, unless they trade Harvin, but that’s unlikely with GM Spielman denying it at the moment, with those three guys, we will see for sure if Christian Ponder is a true starting QB in this league. Kansas City has Alex Smith now and are likely to draft LT Luke Joeckel #1 overall, as for the rest of the offense Jonathan Baldwin and Steve Breaston are not solid receivers (#2’s). If Dwayne Bowe comes back they may still draft a WR for the other side, Alex Smith may need the help. Carolina has an offense that at times looks like clockwork, at other times it’s all about Cam Newton, they need a better receiver than Steve Smith to compliment Brandon LaFell, Smith has always been one-dimensional in my eyes but Swope can add another dimension to put Smith in the slot at his age. Swope could be the steal of the WR class the same way I felt about Ryan Broyles and Randall Cobb the last two years, except no size issues or injury concerns. He is fighting a stereotype that is more used than any other in America. I know he’ll succeed and pull through. Stedman Bailey the WR out of West Virginia is the definition of a big play WR; he played for Coach Dana Holgorsen and flourished under the Air-Raid attack similar to Houston and BYU in the 1980’s and 1990’s. Stedman Bailey is a redshirt-junior who was a four star prospect in the HS Class of 2009. He had offers Florida, Auburn, and Wisconsin but decided on West Virginia, along with his HS QB and teammate Geno Smith. Bailey didn’t contribute heavily as a freshman in 2010 after being redshirted in 2009. But he did have 4TD on 24 catches and 317 yards receiving. Even then WVU fans had something to cheer about. In 2011 as a sophomore he busted out onto the scene in West Virginia’s last year in the Big East. He caught 72 passes for 1279 yards and 12TD. Bailey had a nose for the end-zone; remember he was paired with WR Tavon Austin (later mentioned). They became the most productive duo in college football. His clutch moment (as mentioned with Geno Smith) for the 2011 season was the 4th down conversion vs. the University of South Florida. The catch he made on December 1, 2011 was absolutely ridiculous; it set up a FG that sealed the deal on another Big East Title (share). That eventually lead to a demolishing of ACC Champion Clemson, he had 5 catches for 68 yards and a TD. Heading into his junior year Stedman Bailey and the Mountaineers were facing new competition, The Big 12, now they play Texas, Oklahoma, Kansas State, and TCU. Certainly it was going to be better competition but Bailey only improved his production with 114 catches for 1622 yards with an astounding 25TD! Bailey was tearing them up. They were as team even ranked at #2 by mid-season before a slump that ended their hopes at BCS title. The 38-14 loss to Syracuse in the Pinstripe Bowl showed that the high-octane offense was not suitable for horrid weather conditions. Think about it though, Bailey scored the two TDs in the game for WVU. He had 8 catches for 121 yards along with the two TDs. Now onto the draft, Stedman Bailey according to CBS Sports is a 3rd-4th round pick projection, and that puzzles me a little bit. At 5’10” 190lbs, I see an explosive wide receiver, he runs in the 4.5’s which is fast in my book. He scored touchdowns and he’s matched up against great corners and safeties, the likes of Morris Claiborne, S Kenny Vaccaro of Texas, and others in the Big East and the Big 12. West Virginia’s air raid is no different an offense to Green Bay, New Orleans, Denver, and New England which means he’s pro ready. He did after all finish with 41 receiving TD in his career, enough for the school record in that category. His strengths in my eyes are diverse. The thing that jumps off at you is the chemistry he had with Geno Smith; the catch vs. USF shows that, Geno Smith knew Bailey was his Go-to-Guy. He gets yards after the catch, He can pull a Mike Wallace and hit you deep, he also caught those fade routes that corners in the modern time rules can’t cover. He can catch fade routes as well as shown by the photo above. His weaknesses are not in terms of his skill, they lie within his physical attributes. He’s 5’10 190lbs; apparently everyone in the NFL wants a 6’4” wide receiver an equal to Randy Moss, Brandon Marshall, and Calvin Johnson. Sorry folks those guys are great but what are the odds? Bailey was also blanked out by double coverage but then if teams did that Tavon Austin torched them so I don’t think that’ll be an issue with time and coaching. I compare him to Brandon Lloyd of the New England Patriots. I oppose the comparison of Steve Smith. He doesn’t even run routes he just runs deep, I find him very one dimensional. Lloyd excels in the intermediate passing game; he also has the ability to make circus grabs, and puts effort into catching every ball. Bailey has an advantage that Pats fans liked in Deion Branch and that’s toughness he will get into the end-zone and first down marker. As for team fits I think a match would be the Houston Texans, Miami Dolphins, and the team Geno Smith’s drafted by. The Houston Texans need a WR in the future, other than Lestar Jean and Devier Posey they nothing but even in those two, I just see those guys as projects and injury prone guys. Bailey would provide some explosion on the outside and be a #2 threat behind Andre Johnson who is 31 and needs to be kept in form until the postseason. Head Coach Joe Philbin may go after WRs Greg Jennings and Mike Wallace, but in case they pull a Drew Brees and head elsewhere they’ll need someone there. Brian Hartline is a UFA, he’s not a #1 WR, but Bailey can provide explosion and sure hands that they haven’t gotten since the days of Mark Duper and Irving Fryar. The third possibility could be any team Geno Smith goes to, just remember Indy 2012; they drafted Andrew Luck and Coby Fleener both from Stanford. This could be the same thing, they went to HS together and college ball and they are lethal. Bailey may soar into the 2nd round once scouts see him at his pro day in March. This guy will make an impact; it just remains to be seen. USC has been one of the most explosive offenses over the last three seasons, not a surprise when you have a QB as good as Matt Barkley and a WR as lethal and flashy as Robert Woods. Many don’t have Robert Woods as the #1 WR, instead they have Keenan Allen of CAL or Coradelle Patterson of TENN, they will be mentioned in later posts, but neither can break man coverage like Woods. Of all the problems USC has had since the Pete Carroll era, you can’t blame the offense; you can blame Lane Kiffin for being outcoached against other coaches in the Pac-12 and in the bowl game at Georgia Tech. At 6’1 190lbs, he’s a little light for the NFL, but I care very little about that. In today’s NFL all you need to do is get five yards and a defense can’t touch you. 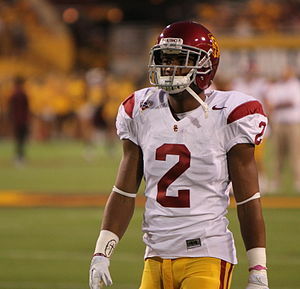 Woods is the all-time leader in receptions at USC with 252. Those big numbers came while playing with Marquise Lee and Damian Williams (2010) and remember that this the University of Southern California we’re talking about, Dwayne Jarrett, Keyshawn Johnson, Johnnie Morton, and Lynn Swann are notable alumni of USC. As a freshman in 2010 he caught 65 passes for 792 yards with 6TDs, quite impressive, and also showing that the 2010 recruiting class was really deep with stars. He not only catches passes. He runs jet sweeps, reverses, and returns kicks. These are skills I think teams in the NFL can take advantage of. As a freshman he was catching the ball with corners, safeties and LBs draped on him. This guy is a red zone threat at 6’1” that is impressive enough let alone the athleticism he possesses. Many big time freshmen suffer a sophomore slump but Woods did the polar opposite, not only did he solidify himself as a star at USC; he became one of the best WRs in all of NCAAF. He tallied 111 catches for 1292 yards and 15TDs, which was in 12 games. Remember they couldn’t play a bowl game due to NCAA sanctions from the Reggie Bush allegations. As a junior in 2012 there were high expectations for him, the offense and team being ranked #1. They may have not have been worthy of the #1 ranking as a team but Woods did not disappoint he had 76 receptions for 896 yards and 11TDs. It’s a drop-off but considering QB Matt Barkley’s injury that prevented him from playing the final two and a half games (UCLA (Barr’s hit causing injury), UND, GT) that’s the difference of 1,000-1,100 from 700-900 yards for a season. 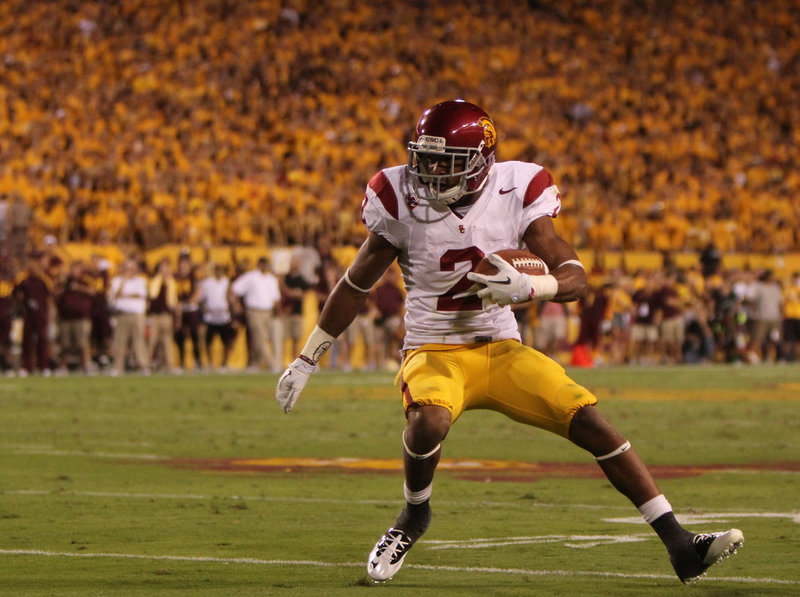 Sharing the spotlight with Marquise Lee the star sophomore also contributed to that. Overall his strengths are obvious as you look into the film is that he excels in man to man coverage, he’s always catching balls in stride, he will run in the 4.4’s so the speed is there, and also is said to have a great work ethic. But why is nobody grading this guy like they did for Justin Blackmon and Michael Crabtree, because of “injury concerns”. But the one strength I notice is that he actually blocks, what a shocker this opens up a market for him that many others wouldn’t even consider. I put asterisks to the injury concerns because I don’t see the worries, he started all 37 games he was eligible to play in his college career, but among other weaknesses include bulk and at 190lbs I feel there is a point there, he will need to bulk up in order to be an outside guy that can beat press coverage. He also had “concussion symptoms” but I’m not as sure as to what I should feel about that. Also his attitude of the reason he left USC, apparently it was cause of his targets, but I don’t feel like it’s a reason to stay away because I think Lane Kiffin is the WORST coach of a Power 6 conference in NCAAF that is not negotiable on my round-table. My best team fits are the New England Patriots, Buffalo Bills, St. Louis Rams, and Seattle Seahawks. First with the New England Patriots, they have a lot of cap room now that Brady has extended for less money, they still have a decision to make whether to sign WR Wes Welker. If it were me whether they do or don’t, they should draft Robert Woods with the 29th overall pick. In recent years they’ve become soft, and now Rob Gronkowski and Aaron Hernandez are their two best targets to me, that’s sad! Get Tom Brady a “REAL” WR to throw to, pair him with Lloyd or another draft pick (named later). Also giving Ryan Mallett or future quarterback a #1 target. In the case of another AFC East team the Buffalo Bills, they have WR Stevie Johnson and RB CJ Spiller to look forward to. Now get another WR to pair with Johnson, and fix that wretched secondary and now you’re in business to compete with the new breed of the AFC Elite, Cincinnati, and Houston etc. Woods would be a definite plus and Head Coach Doug Marrone has seen him torch his team, I’d recommend pairing him with Nassib or Barkley (hint). St. Louis is in a division that I feel is wide open, I’m not sold on SF and Seattle worries me with the lack of a great WR (later mentioned). Sam Bradford has talent, I feel there defense is good, they can attack those needs through free agency, but in that late 1st area they can use the Washington pick to take Woods, he’s perfect to pair with Brian Quick and UFA Danny Amendola. Now Bradford can maybe have a chance to excel like the Heisman winner in ’08 was always thought to do. Seattle is the one can make them a true Super Bowl threat for years to come. They need to replace Sidney Rice, he’s soft. On another note Russell Wilson needs a true #1 WR. Robert Woods was recruited by Carroll and I know Pete Carroll of all people will take the chance to get a hard-working guy who will block for Marshawn Lynch down the field. Now Russell Wilson can form with him what Aaron Rodgers has in Jordy Nelson and Greg Jennings, Tom Brady and Wes Welker, Eli Manning and Victor Cruz etc. I believe him to be the #1 WR in this class, based on not only skill but potential. He’s not raw like Coradelle Patterson and has speed that Keenan Allen doesn’t appear to have. He did play with a great QB which is a benefit to me but some may find it as a disadvantage, after all how many USC WRs have produced in the NFL since Keyshawn Johnson… You get my point. But he’s different and I feel he has ability no one in this class and last years class don’t have. My comparison for him is Anquan Boldin and Dez Bryant. He has the blocking and 1on1 skills those guys have, but my reason is because he’s not afraid to catch the ball anywhere on the field. I believe he will be a starting receiver for the team that drafts him at the start of the 2013 regular season, he’s that committed.